Why? Oh I don’t know. Maybe because it’ll help said top hat-wearing protagonist get back to her life of space-travelling fun times? Sounds like solid motivation to me, and I’d wager the journey to find them will be one full of adventure too. Even more so once you start assembling new hats, and according to the developer, these include “a wooden ghost mask that allows her to peek into other dimensions”. Groovy stuff for sure. Also, explosive concoctions… are somehow totally related to hats in this game. At one moment you’ll be solving the Murder on the Owl Express by finding clues and interrogating the locals, the next moment you’ll be the band marshal in The Big Parade, or sneaking through the bird-run Dead Bird Studio! Now, with five huge worlds to explore, there’s bound to be not only plenty of yarn – for hat-making – to collect, but also a lot of ground to cover. Walking? Heck no! Not when she’s able to double (maybe even triple?) jump, climb walls and… wait, swing across gaps? All that AND she’s able to construct hats which give her additional abilities? I almost feel bad for anyone who may have grabbed her misplaced Time Pieces. Almost. Nah. 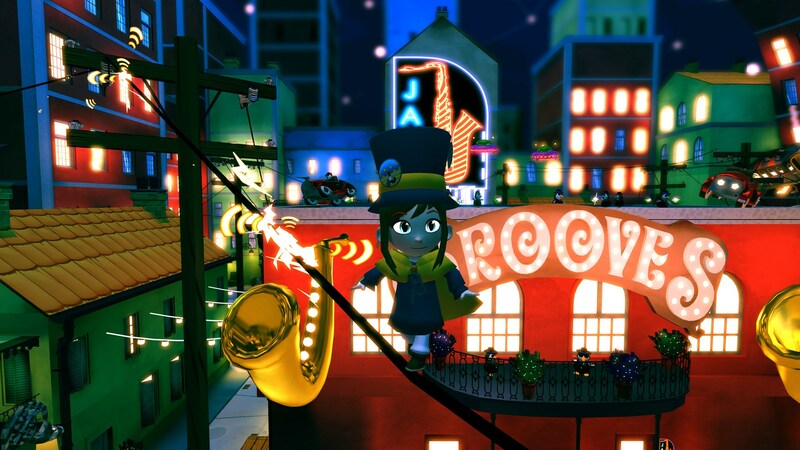 A Hat in Time is available from GOG.com, Humble Store and Steam, carrying a $29.99 price tag.